Brad Brescia, a 2006 Glassmen member, sent this picture. This is a picture of me with my friends John and Tim. 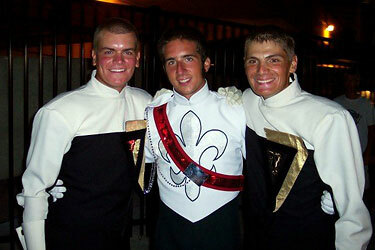 We all went to high school together and dreamed of marching in a drum corps together. As saxophone players, Tim and I thought of this as impossible. Tim auditioned for a spot in Glassmen last year, and I followed this year. We all had the summer of our lives and it turned out that on Tim's last night at the World Championships, we were able to all come together to get a picture before retreat and immortalize our dream that finally came true.